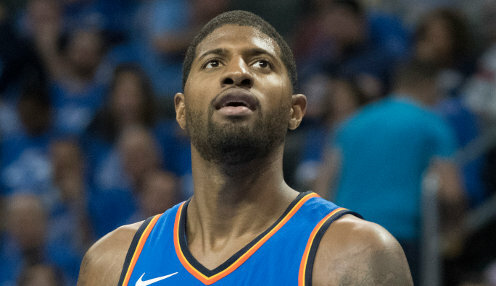 The incredible gamble made by the Oklahoma City Thunder paid off as the clock struck midnight for free agency as Paul George announced that he would stay with the Thunder. Traded by the Indiana Pacers after telling them that he would elect for free agency, the Thunder appeared to be nothing more than a one-year stopover before George would inevitably sign for the Los Angeles Lakers. Indiana acquired guard Victor Oladipo and forward Domantas Sabonis for their franchise star in a trade that universally was panned as one sided in favour of Oklahoma City. However back in Indiana after staring for the Hoosiers in college Oladipo transformed into the player projected when taken with the second overall pick by the Orlando Magic in 2013. Suddenly the deal looked like a steal for the Pacers with the Thunder only getting George for the single season. Now the trade is likely to go down as one of the few stereotypical win-win scenarios where both sides are happy with the outcome. With Carmelo Anthony also back in the fold, the question is can Oklahoma City figure out a rotation that takes advantage of their individual talents to form a cohesive team. The Thunder did not have a first round draft pick this season, but might have got something of a steal in Devon Hall from Virginia late in round 2. Hall projects as a nice rotation piece as does Kevin Hervey, a power forward also taken late in the second round. Meanwhile, Tri State are 1001.00 to the Big 3 crown this year, with Power 1.66 and Trilogy 1001.00.